John Narey died in the mine rescue effort during the mine disaster at Monongah Mine, West Virginia Dec. 6, 1907 (from an article in the Latrobe Bulletin, Latrobe, PA, Dec. 18, 1907). 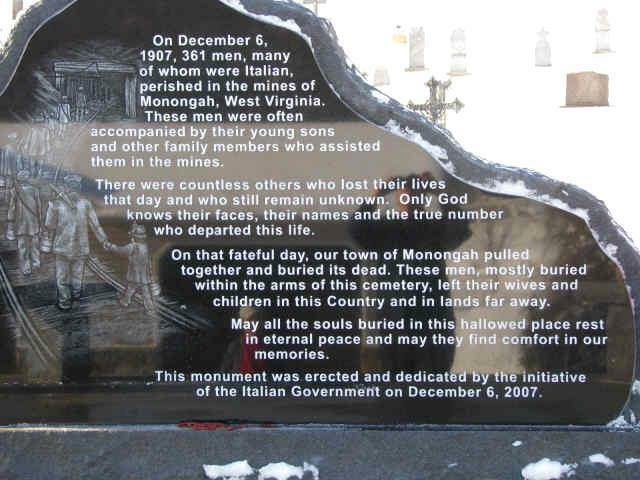 In all, three men are said to have lost their lives in the rescue work at Monongah, apparently overcome with smoke or poisonous gases lingering in the mines because they had no proper equipment for entering exploding mines, or proper equipment to revive rescuers or miners who had succumbed to their smoke and poisonous gases. The No. 6 and No. 8 Mines were slope openings about 1¼ miles apart. The mines were ventilated separately but were connected so that each mine could be ventilated from either opening in case of necessity. Rescue crews restored ventilation by building brattices to conduct the air from No. 6 fan. Three fires were found and extinguished with water. All props and timbers were blown down, causing heavy falls of roof, except in one entry. By December 12th, all workings had been ventilated, and searched and 337 bodies recovered. In the next week 17 others were found, and 8 more were taken out in the work of removing the fallen rock and restoring the workings. One of the dead was an insurance agent who had entered the mine to do business with the men. About the time of the explosion, a trip of loaded cars had reached the knuckle of No. 6 slope, when part of the trip broke away and ran to the bottom of the slope, piling up and blocking the entry. It is thought that the dust cloud resulting in the intake air current was ignited by an arc from electric wires torn down by the wreck or by open lights of men in the vicinity. This opinion was accepted by some of the most expert of the investigators. 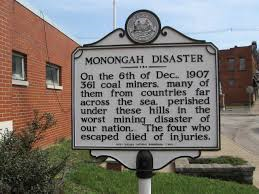 Separate investigations were made by parties of mine inspectors from West Virginia, Pennsylvania and Ohio, representatives of the Fairmont Coal Company and the Federal Geological Survey, and by a Commission of European mine investigators who were in the United States at the request of Dr. Joseph A. Holmes to study the problem of coal mine explosions. The evidence of the origin of this explosion was much confused, and some of the investigators attributed the explosion to blown-out shots, others to gas ignited by open lights, or to dust clouds ignited by electric arcs or open lights. 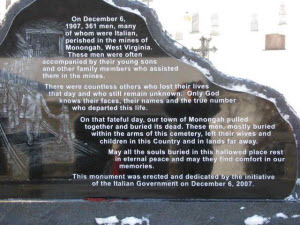 Monongah, West Virginia, Dec. 7 -- In the greatest disaster in the history of coal mining in West Virginia, Friday, not less than 400 miners met their death, by an explosion of black damp. Fire rescuing parties, with 10 men to each party, are working like Trojans at different parts of the two mines to the end that every nook and corner of the workings may be reached in the shortest possible time. There is a large force of experienced miners for this work and they are working in relays with short turns, owing to the accumulation of gas which prevents the men remaining long within the mine. The explosion occurred shortly after 10 o'clock to-day, after about 400 men had gone to work in the two mines affected. Those mines are Nos. 6 and 8 of the Consolidated Coal Company, situated on opposite sides of the West Fork River at Monongah, but merged in their underground workings by a heading and on the surface by a great steel tipple and bridge. The finding of the three corpses and the four living men is the only reward for strenuous and uninterrupted work on the part of large rescuing forces that immediately after the explosion set to work at every possible point. The living men are unable to give any detailed report of the disaster or even to explain how they reached the surface. They state that immediately back of them when they began their, frantic struggle for liberty there was a large number of men engaged in a similar effort, while still further back in the workings there was a large number of whom they know nothing. It is the opinion of mine officials and others familiar with mining that these seven had not penetrated the mine as far as had the majority of the day shift when the explosion occurred and that they had headed for and reached the main entry before the heavy cave-in that now blockages the entrance more than a few hundred feet beyond the main opening of mine No. 6. As to the miners referred to by the rescued men as having been alive when last seen, it is believed they were caught back of a heavy cave-in of coal and mine roof and that they could not have survived more than a few minutes in the deadly gases with which the entry filled as soon as the ventilating system was interrupted. There is more hope for those in more remote sections of the mine, as they may have reached working where fresh air is supplied by other openings. But at best only the most slender hope is entertained for the survival of anyone of the men in the mine until the debris can be cleared away and communication with the outside re-established. The two mines regularly employ 1,000 men, working in two shifts, 500 during the day and 500 during the night and the best information obtainable at this time is that nearly the entire day force had gone to work this morning and that all were caught. It was shortly after 10 o'clock when the explosion occurred and at that hour even the latest straggling force is customarily at work, according to mine officials. Beyond these figures the company officials do not attempt to give estimates. The general opinion is that the number of dead and imprisoned will reach 400. Some believed that number would be exceeded, claiming that more than 500 of the total force worked during the day, while others through the number would be smaller. The more conservative estimates placed the number of victims at 300 or 400. There is much speculation as to the cause of the explosion but the most generally accepted theory is that it resulted from black damp, scientifically known as methane. It is believed a miner attempted to set off a blast which blew out and ignited the coal dust, a highly inflammable substance found in greater or less quantities in all West Virginia mines. However, all explanations of the cause up to this time are necessarily speculative. Only a thorough investigation after the mine is reopened will disclose the cause if it is ever ascertained. The explosion affected both mines and so far as is now known appears to have done about as much damage in one as in the other. It has not been established in which mine it originated. Evidencing the terrific force of the concussion, props in the entry of No. 6 mine, supporting the roof were not only shattered and torn from their positions, but were blown out of the entry and to the opposite side of the river. Other evidence of the awful force is shown in every section of the mines that have been reached by the rescuers. Huge quantities of coal and rock have been loosened and hurled into every opening and all of the underground structure is wrecked beyond semblance of its original shape. The entry of No. 6 mine, 300 feet from the mouth, is piled high with the wreckage of two strings of cars and two electric motors. Some of the rescuers have climbed over this and found dead bodies beyond, but have made no attempt to remove these to the surface, partly because it would be almost impossible to carry bodies over the debris, but more because they do not want to lose any time in reaching other sections of the mine where it is possible men still living may be imprisoned. The cars are being righted as fast as possible and removed from the entry together with all other obstructions. All of the headings leading off from the main entry are being cut off by canvas and barricaded as fast as they are reached by the relief workers so that the most innermost workings of the mine may be given the benefit of the ventilation system to sustain any that may be yet living and make possible an early exploration of these workings. The American miners of the town have been placed in charge of the relief work but the Italians and other foreigners are working under them faithfully. It is impossible for a man to remain long in the depths of the mine and the rescue forces are divided so as to work in relays with frequent reliefs. Many in the relief parties have already become exhausted and have been sent to the surface. The mines are owned and operated by the Consolidated Coal Company of Baltimore. Its general offices are in Baltimore and its operating offices in Fairmont, W. Va.